“Really!? That’s great!” This was the response of the volunteer at the check-in desk when I chose the 10K distance over the 5K. I was mildly amused at her amazed reaction but a quick glance at the start list showed the vast majority of folks were entered in the 5K with only a handful doing the 10. Of those, most were a lot younger than me. I’m assuming she was surprised an old man could actually run 10K. For weeks now I have been tossing around the idea of when, where, and indeed if to return to racing at all. 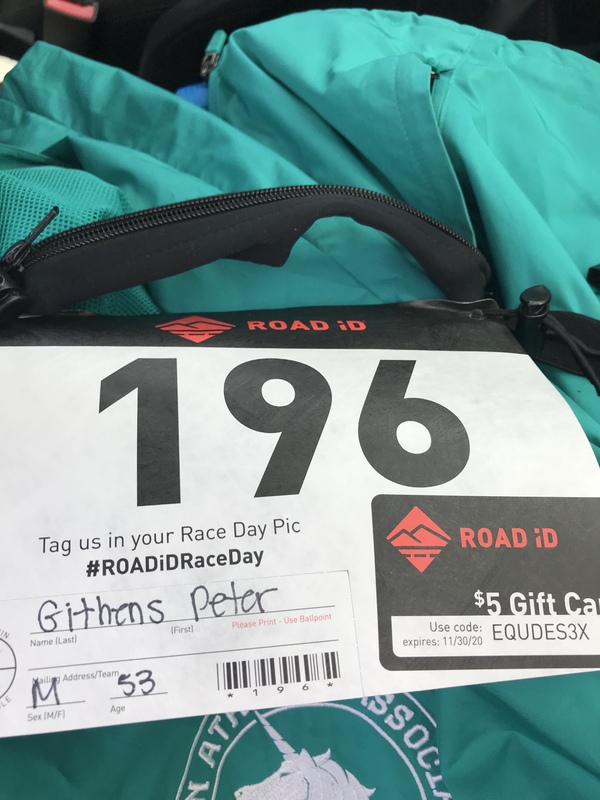 My last race was the Pocono triathlon back in August of 2017 two months before the surgical repair of my groin and hip. I hadn’t raced a lot that season spending most days dealing with anything from mild discomfort to annoying pain so racing wasn’t a top priority. After surgery, I was on a nice comeback trail before being sabotaged by a crazy, chronic foot condition that probably ended future marathon hopes. I rested. I rehabbed. I quit running altogether. I missed running. I started running again. Running has felt good as has cycling, swimming, and other work at the gym. I’ve been perfectly happy just being fit. It has been hard to decide if I want to make a return to racing or gently bow out and continue to race vicariously through friends. The Boston Marathon takes place Monday April 15, 2019. I won’t be participating again but will be obsessively following my friends that are. Monday is the Boston Marathon. I have a lot of friends who will be taking part in that wonderful event and others racing at Trappe Pond in Delaware and still others heading to Rehoboth for the Coastal Delaware Running Festival. Feeling left out and a bit envious I scoured the web to find just the right race. Something not too long, and maybe not too competitive where I could get the juices flowing. It had to be nearby yet big enough get mentioned in the area’s major newspaper¹. And if not a major newspaper at least a worthwhile post on the local fire company’s facebook page. After an exhaustive search during my first cup of morning coffee I found it! The prestigious John Doyle Rock the Wall 5K Run and Walk/10K Run in East Coventry Township. Whew! Typing that name will get the ol’ carpal tunnel syndrome fired up. Registration opened at 8:00 and the race started at 10. I got dressed and hustled off to East Coventry which is only about 25 minutes away. Upon arrival, I could tell by the parking lot it was not a big race which was fine. I really did just want a bit of an appetizer to see if I still had the desire to chase finish lines and podiums. After eliciting the exclamation of surprise from the check in volunteer, I took my warm winter hat and insulated shirt both with the John Doyle Rock the Wall 5K Run and Walk/10K Run race logo back to the car and got ready to warm up. Not really bad schwag for a small local event. Another older gentleman chatted with me as we walked. He had apparently done this race a few times and noted this would be the first year we would get to use the trail because the previous times it had always snowed. “Trail?” Evidently I hadn’t read the race description very closely. It turns out I kinda like trail running but today I had hoped to pick a simple road course to measure where I am from a fitness perspective. It has been an eternity since I ran a fast race of any distance. The last really good one would have been the Run for the Red Marathon in 2016 where I last qualified for Boston. After that a plague of injuries and birthdays ensued leading to an older, slower, happy-to-just-be-upright version of Pete. The friendly gentleman continued talking. We chatted about racing, the hard overnight rain, and how nice the day was coming along. I explained that this was my first race back in quite a while due to injuries. “Well”, he said “you picked a good one. But it is pretty much one big hill”. “Hill?” Apparently I really should have paid closer attention to the course map. Like trails, I’m not afraid of hills. In fact, I like running them, but had hoped to sort of get the “measure of the man” today from a time and pace perspective. After my cup of coffee and decision to race I had fired up Athlinks to see exactly what my 10K PR was. I haven’t done a lot of 10Ks. I never really liked the distance as I find it difficult to pace and to get into a groove. For a 5K I go out all ablazes and then hope to hang on in the last mile. In a 10 mile event (perhaps my favorite distance), I can use the first mile or two to find a good groove and then build momentum. But if I try that in a 10K I hemorrhage too much time at the start. Be that as it may, in the new, more limited running future my scoliotic spine has built for me, I need to start to love it. It is also a really good distance to calculate different race paces and gauge speed. That is assuming you aren’t running the John Doyle Rock the Wall 5K Run and Walk/10K Run. Athlinks is pretty awesome though I need to investigate my 10 mile results. I’ve been faster than that. Overall I should probably have a post 50 year old reset. Now there is nothing wrong with the John Doyle Rock the Wall 5K Run and Walk/10K Run. (From now on we’ll just call it the JDRTW5RAW10R for short). The people were friendly, the course fairly well marked, and the post race snacks featured 16 oz. bottles of really good chocolate milk! What else could a runner want? I just hadn’t planned on hills and trails. Always pay attention to the course map and elevation profile when picking an event. As much as I hate mile by mile race reports let’s talk through this a bit. The course was sort of a lopsided figure 8 starting right in front of the township building. We were all casually gathered at the start at about 9:55 talking about running shoes and comparing Garmins. Suddenly, a voice on a megaphone said “Ready? . . . Set? . . . Go!” and we were off! Both the 5Kers and 10Kers did the 5K loop to start. We headed downhill, turned West and ran along a creek. It was apparently a bad night to be a frog. There seemed to be an abundance of squished amphibians all over the road by the creek. The downhill and flat didn’t last long. Within the first mile we started climbing steadily back upward ultimately turning off the paved road and on to a field service road where we tracked along the fields for the next mile or so. As soon as I heard about the trails and hills I had tossed any vague race goals I might have had out the window. I had hoped maybe to do a 45 or 46 minute 10K. I had plugged these values into a Pace calculator. 45 minutes had come up with some absurd pace I would have considered pretty slow and pretty easy a few years ago but then I remembered it had been 8 years since my last 10K. Not too long ago this would have been an easy pace for me to keep for 10K. Now not so much. Even the required pace for 46 minutes seemed iffy. As we circumnavigated the first field I threw all that out the window and focused on trying to pass others in front of me. Trail running is always slower than road running. Hill running is always slower than flat running. Running uphill, on wet trails is slower than evolution but onward I went. Sometime in that first mile I passed the chatty, friendly runner whom I would leave him behind for good. I had no way of knowing who was doing the 5k and who was doing the 10K. I would have to wait until the 5K finish and see who turned to head for the 10K loop. I think this is the time in the report I’m supposed to post mile splits and say how I felt. Despite the overnight deluge, the trail between the fields was actually pretty good. I didn’t have trail shoes and didn’t need them. I was able to run well, and wasn’t struggling with footing so that was a plus. Instead I concentrated on watching for holes, sticks, or honey badgers and kept the crew of younger folks ahead of me in sight. That crew included an amish lad in suspenders and full black pants. Somewhere after the two mile mark we made our way back to paved road. We would stay there until the 5K finish. As I rounded the bend and headed up the hill to the township building I have to admit there was a momentary desire to just call it quits. I longingly watched one runner cross the 5K finish but then the next 3 turned for the 10K loop. Somewhere inside a competitive spark came to life. I knew I would not be able to catch those younger, faster runners today, but with a bit of speed work, and a bit better diet maybe the next time. I approached the finish and turned left to the cheers of the few volunteers and family members at the finish. The majority of the second half would be on the trails. This started with the crushed gravel path that led toward the firehouse, and then we turned and headed out on a local nature trail. Apparently John Doyle, the namesake of the JDRTW5RAW10R, had something to do with the nature trail. The proceeds of the race benefited the organization that maintained said trail. The JDRTW5RAW10R promises free race pics but as of yet they have not been made available. Instead I found what I believe to be a reasonable likeness of me trail running. After leaving the crushed gravel, the trail went down along a creek and actually got a bit technical for a half mile or so. I was almost wishing I had trail shoes but then I cleared the woods, climbed up to the edge of a field and continued on much less technical, if not less uphill, grassy terrain. There was one washed out rutty section with a volunteer giving directions. Not wanting to roll an ankle, I walked over the ruts before the path smoothed out again. The young lady advised me to just keep following the tree line. Oh right. It’s time for splits and feelings. Mile 4: Can you switch a Garmin to furlongs/fortnight? There are no Honey Badgers in East Coventry Township. A good chunk of mile 5 stayed on the trails. There was one section where I slowed considerably. It was a grassy strip between a freshly plowed field and a fenced yard with a large malamute who, despite the fence, seemed intent on breakfasting on a passing runner. The grass in this section was a bit long and I couldn’t see hidden dangers like holes or rocks so took my time. It was only a couple hundred yards and then it was back to pavement. The trail might have ended but the hills did not. The remainder of the route was a series of rollers. Happily, I had found a reasonable running rhythm and each time I found my tired form slouching, I remembered running friend and coach Tim Jones’ wise words: “When the going gets tough go to your arms”. I straightened up and pumped my arms to climb each hill. Finally, I crested the last hill and could see the finish. Mile 5: Perhaps the check-in volunteer was right. We’re the King of the World! Can you amputate us if you are going to keep this stuff up? Indeed there was the finish line. This is something I haven’t experienced in quite a while. There was nobody to race against to gain a last spot. There was no big crowd cheering though the few onlookers dutifully clapped and yelled “Way to go”! (I’m pretty sure I heard one surprised voice exclaim “Hey, the old guy made it!”) It was a finish line nonetheless. By then the small competitive spark had smoldered, smoked and become a burning flame. I’d forgotten how great crossing the finish line is no matter how small the race. I would give you the .2 mile split but . . . well . . refer to the course map. Both it and my Garmin are pretty accurate. Let’s just say I enjoyed a hilly cross-country run at a pretty good pace for an old man. I enjoyed it enough to know I still want to do this and will be pinning on a race bib again soon. ¹A “newspaper” was a daily publication printed on actual paper and delivered daily (sometimes multiple times) to each and every home. As the name indicates, a newspaper was once the sole source of a household’s knowledge of current events, weather, sports (running is always on the last page), for-sale ads, comics, and crossword puzzles. Yep. All that in a convenient package that one could fold up and take to the rest room. Once read, this useful journal could be recycled as a tablecloth, umbrella, fish wrapper, dog training tool, or fire starting accelerant. Ask your parents about them kids. I just read your last 2 blogs…. Congratulations on the race!! You may not have felt fast, you may not have realized what you signed up for, but in the end, you did your best a d your time wasn’t awful!! I could post an awful time…. On the prior entry. Don’t sell your adventures short!! You have killed elk in 2 different states, you’ve fished in more than a handful of states, you ventured to Newfoundland to chase moose (and see the encampent of the greatest Viking who ever lived)!! You’ve flushed grouse, you’ve talked to turkeys (no, not me, Jim, and Dave). You’ve ridden your bike and ran on roads that most people will never know exist. The Amish kids wave to you from the back of the buggies. Adventure and accomplishments are different for everyone. You’ve had more than 80% of the people alive in “your era” (which is all you can compare against). There’s more to come. You’re not old. You’re not overly broken….. I look forward to the up coming adventures. The ones I have the good fortune to share, and the ones I get to read about!!!!! Again, congratulations on the race!